The First State of Florida's Clinical/Educational School, Independent, Non-Sectarian And Co-Educational School For Grades Pre K-3 To 12th Grades. Robotics Program - 65% of today's students will end up working in jobs that have not been invented yet. We prepare our students for this challenge. Project Based Learning, Student Centered Learning, Gifted Curriculum, Tablet Program, Typing Program, Science Club, Environmental Club, Student Council, Publishing & Political Clubs. 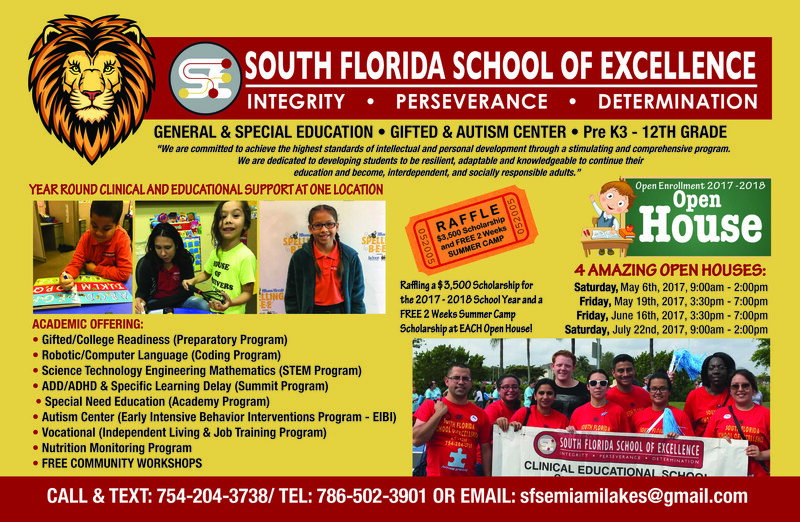 South Florida School of Excellence - General & Special Education - Gifted & Autism Center is the first Dade County's Clinical/Educational school is perfectly designed an independent, non-sectarian, and co-educational school for grades Kg through 12th grades, with the capacity of 200 students - Pre K-3 & Pre K-4, (Coming Soon). The School campus has 60,746 square feet in size accommodate a logical separation of facility and outdoor recreational area. Gated school entrance with 24/7 security guard and surveillance cameras are installed inside and out side the facility. Surveillance cameras are installed in the Autism and Special Needs classrooms as well. The South Florida School of Excellence is the first and only “One Stop Shop” clinical/educational setting of “Multi - Dimensional Model” located in South Florida. The school is dedicated to serving the educational and social emotional needs of all students, including: those who are Average, At Risk, have Disabilities, Gifted, Autistic and Asperger. The school provides well structured, academically focused classes with high rigor curricula for Science, Technology, Engineering, and Mathematics (STEM), Project Based Learning (PBL) and Community Based Learning (CBL) skills for college readiness. Instructions offers a unique combination of personalized curriculum from highly qualified special needs instructors and assistive therapies from certified contracted professionals to comprehensively serve the intellectual, physical, and emotional needs of every general and special needs student. Psychological Evaluations, Mental Health Therapy, Speech and Language Therapy, Occupational Therapy, Applied Behavioral Therapy, Physical Therapy, Student Case Management Services, Vocational Rehabilitation Training, Nutrition Monitoring, Dental and Vision screenings by licensed providers/sub-contractors. School professional strives to prepare students for productive and successful entry into higher education and the workforce. Environmental Club, Science Fair Club, Publishing Club, Spelling Bee Club, Vocabulary Bee Club, Politician Association Club, College and Career Prep Clubs, Safety Patrols, Student Council, Music, Chorus, Drama, Dance, Gymnastics, Arts, Karate, Soccer Club and more. NASA is taking bold steps at the K–12 grade levels to prepare the next generation of explorers. Building on previous accomplishments, NASA has established a series of innovative programs designed to stimulate student interest in STEM. Tough previous research has associated numerous different gene mutations with autism, exactly how these mutations contribute to the development of the condition has been unclear. Intake & Lottery Process. Due to the high enrollment rate, the school will be hosting a lottery event for the new families for the school year 2016 - 2017.